/ why the ramp in pressure?? why the ramp in pressure?? RE: why the ramp in pressure?? "Common in the Respironics APAP models is a “hunt and peck” search pattern, as part of the device’s algorithm is to find optimum therapy pressures in the face of airway resistance. The unit will increase pressure by 1.5 cm H2O over the course of 3 minutes and monitor the flow to see if there is an improvement. If there is none, the unit returns to the original pressure within 1 minute." The pressure ramp in my posted chart is 3 minutes long going up, and 1 minute long falling. It rises from 9cm to 10.4cm and falls back to 9cm. bingo! I am going to print out that article and read it thru. Probably pick up some good ideas for using my machine. at least I will understand it's limitations. This is all very interesting stuff, eh? I had the same hunt-n-peck haunt me. From 7.5 to 9.0 and back all night while I had a clean events graph (no FLs, no O, no H, no RERAs). So I moved the range to 8.0 - 9.0 so eliminate the hunt-n-peck. It worked for a night. But then, it started hunt-n-peck from 8 to 9 and back multiple times. Last night, I set it to APAP, min=max=8.0. No hunt-n-peck. RDI of 0.14 And I feel even better today than on APAP (with RDI < 0.5 most nights and some nights at 0.0). If you like a constant CPAP pressure, you may try to set your APAP in a very narrow range OR set min=max and evaluate your results with SH in the morning. It will also show you FLs if you keep the machine in APAP mode and set min=max. You can slowly iterate your set pressure by 0.5cm at a time and get to a level where FLs are eliminated. If you can't raise the pressure to that level without compromising comfort, you will need to stick to APAP with a tolerable range. An old article from 1998 will help. I actually read it on this forum. PRS1 Auto & Dreamstation Auto w/ P10 and straight pressure of 7cm. Dottore, I have seen the unexplained pressure increases in my own results and that's why I really didn't want to get pinned down as saying the ONLY reasons for pressure changes is FL and Snore events. There are just aspect of the pressure algorithm I don't pretend to know or understand. This article seemed to hit on at least part of the equation, and another is variable breathing. Not periodic breathing, variable breathing. I was involved in a very long forum conversation some years ago on that and I'll try to find it and link there. This forum doesn't like links to the "other" forum, but I'll figure it out. One article I read said that the original use of auto cpap was to find the right pressure for cpap. The auto pap was allowed to hunt around for a few nights then the clinician looked at the results and figured out what the right pressure was for cpap. But to do that you really have to understand what the machine is doing. As for setting min==max on your ps1, why not just set it to CPAP mode? That's what I'm planning to do once I get in a few more nights of data. (02-20-2015, 09:50 PM)Sleeprider Wrote: Dottore, I have seen the unexplained pressure increases in my own results and that's why I really didn't want to get pinned down as saying the ONLY reasons for pressure changes is FL and Snore events. There are just aspect of the pressure algorithm I don't pretend to know or understand. This article seemed to hit on at least part of the equation, and another is variable breathing. Not periodic breathing, variable breathing. I was involved in a very long forum conversation some years ago on that and I'll try to find it and link there. This forum doesn't like links to the "other" forum, but I'll figure it out. Thanks. I understand the need for caution in trying to explain what a machine with an unknown, complex algorithm is doing. In this case, the close match to what the article described, the lack of any events or anomalies in the data, similar experiences of other users and the repetitive nature of the ramps convince me that it's the built in "hunt and peck" of the ps1. BTW in the past few days I did see several other unexpected pressure ramps, including a ramp to 15cm that nearly blew my mask off my face, but those were indeed associated with events. so, yes, lots of things can cause the auto cpap to change pressure, but in this case I think it's something I don't need to worry about. (02-20-2015, 06:58 PM)quiescence at last Wrote: from the above link, notice how the REMstar has beats during the 'normal breathing' times, just like the OP. yep, and they are 1.5cm, too. Other Comments: Diagnosed 2011. Conquered aerophagia. yet my machine, for some reason or other, took it upon itself to ramp up the pressure. 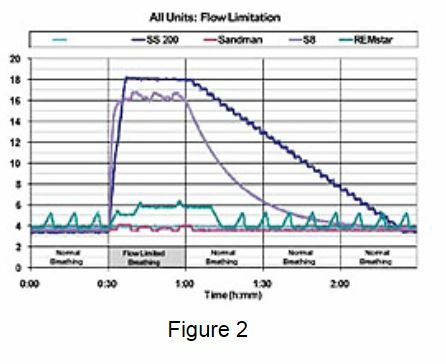 I would need to zoom in on the flow rate graph to tell for sure, but it looks like the inspiratory (positive) parts of the flow rate graph might be showing that classic "chair shape" during the times that the pressure is ramping up. There should also be a corresponding increase in flow limitation at these times, so I'd need to see that graph, too, to be sure. Take a closer look and you should see a definite difference in the shapes of the flow rate graph during those times that the pressure is ramping up. It's these shapes that precede obstructive events, and so the machine is attempting to prevent them before they happen. Quote: Question: Why is my pressure increasing when there don't seem to be any events? thanks, good general points to look out for. but take a look at the 9th post in this thread. The blue line is the respironics ps1 in a simulated sleep test. The sawtooth, which is exactly what happened on my machine, occurs during periods of simulated normal breathing. The referenced article explains that this is what the ps1 does -- if there are no events or breathing problems, it slowly ramps up to try to find an optimum pressure. the ramp up takes 3 minutes and ramps up 1.5cm. If it doesn't find a better pressure, it ramps back down, taking 1 minute. This is just the way the machine works. there are other times in my sleep when the pressure ramps because of events or breathing problems, which I understood. Now I understand these, they are actually a sign that all is OK.
Did you know that Philips' motto was "Let's make things better". This is a Philips Respironics machine trying to make things better. (02-20-2015, 07:17 PM)dottore Wrote: One article I read said that the original use of auto cpap was to find the right pressure for cpap. The auto pap was allowed to hunt around for a few nights then the clinician looked at the results and figured out what the right pressure was for cpap. But to do that you really have to understand what the machine is doing. The reason I am not setting it to plain CPAP mode is because I read it on this forum somewhere that once you set a PR machine in CPAP mode, it stops flagging flow limitations. I want to see FLs flagged so that I can raise the pressure manually if needed on the next night. thanks, I will avoid that mistake thanks to you! These machines are far more complex than advertised.